Dust off the drafting table, refill the clutch pencil and grab the dividers. 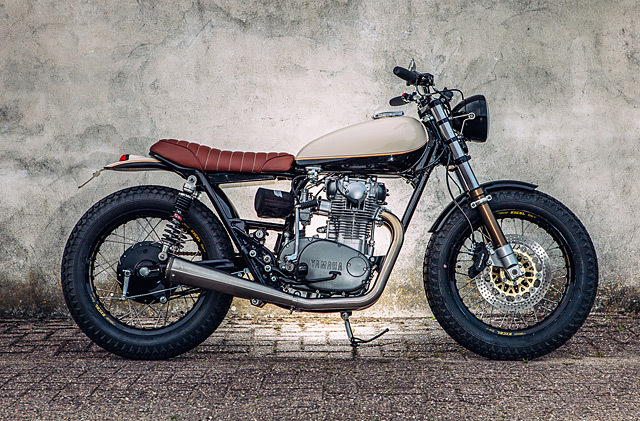 Retired Dutch Architect Henk Woltjer has teamed up with local shop Motogadgets to create the perfect motorcycle to relive his youth; it’s a millimetre-exact Yamaha XS650 tracker inspired by the first bike he built some thirty years earlier. In the early 1980’s Henk built a Yamaha XS650 hardtail chopper, it was a mean machine but on the hard streets of Amsterdam it did his back no favours at all. After a break from bikes for a little while he bought a yellow HD Softail, but the big Harley just wasn’t right for Amsterdam either. 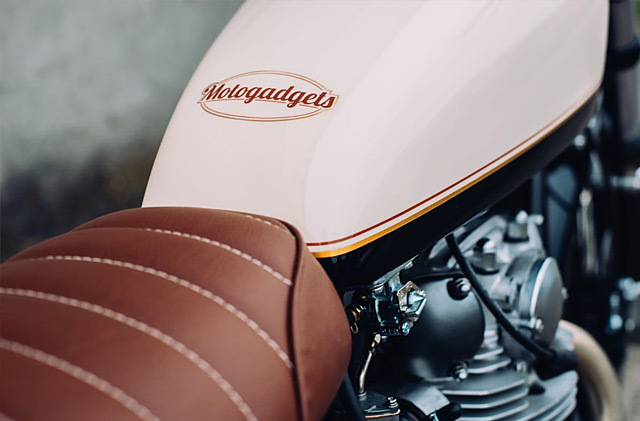 Years later Henk caught a bug, a disease that has become a pandemic around the world, the café racer virus and to get his fix he headed down to Motogadgets in the neighbourhood of Zwolle in the North of Holland. 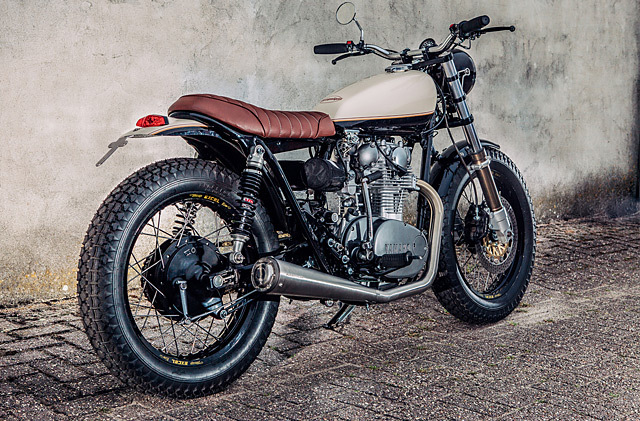 There Yamaha expert Jeffrey Wardenaar repairs XT’s and SR’s and builds beautiful customs and the inspiration was born for Henk to buy the bike of his youth but give it an entirely different flavour. No longer interested in the hardtails of the past he drew up his ultimate machine, a stunning, go anywhere, Café Tracker. The 1979 Yamaha XS650 donor bike was in reasonable condition with a running engine but was definitely showing its age. 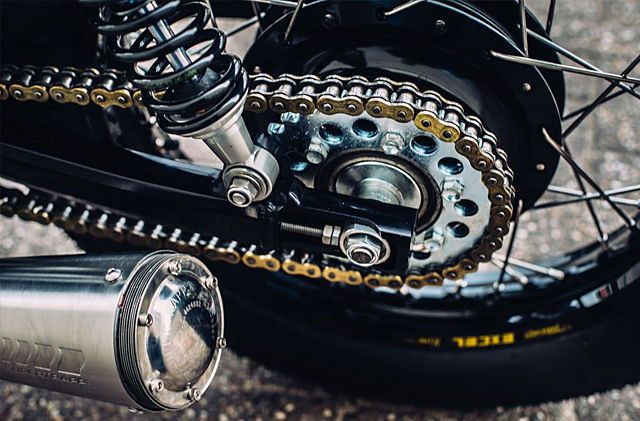 Some might have been tempted to simply bolt off and bolt on parts but you’ll never achieve a high-end finish on an old bike with that process and Motogadgets do things properly. The bike was completely torn down to a bare frame, blasted and cleaned up to create the perfect skeleton with which to work. The smoothed out frame was chopped at the rear to suit the new seat and was then coated in black that allows the main elements of the bike to really pop. To further clean up the look a small box was fabricated to go under the seat were a small lithium battery and all the wiring now hides. 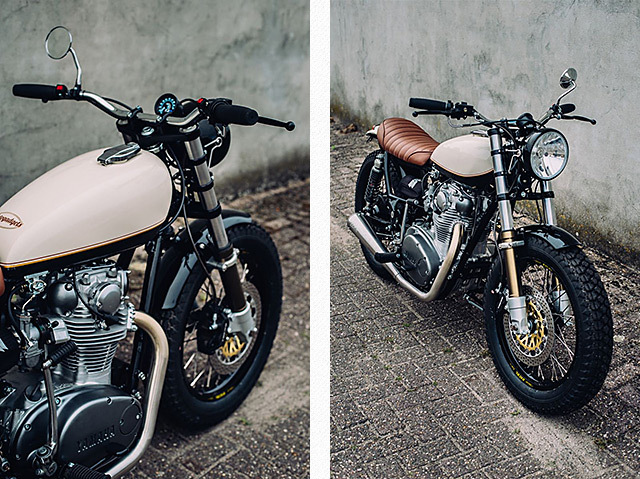 That seat is from Yamaha experts MotoLanna and is one of their Classic Style V3.0’s in dark brown leather with white stitching. 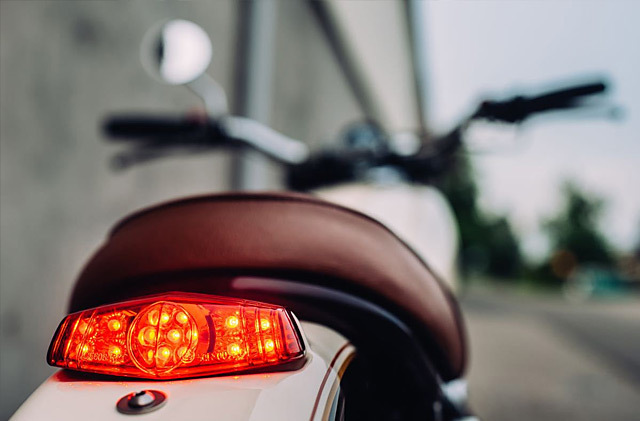 A rear fender is a must have according the Henk for the Dutch weather so Motogadgets sourced an LSL item that has a rear tail light seamlessly integrated into the metal. 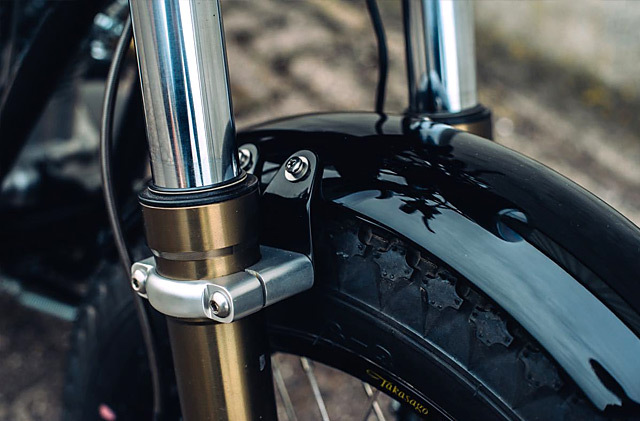 The front fender is Jeffery’s work that does just enough to take care of water and debris without interfering with the lines of the bike and is cleverly attached to the lower fork sections with custom aluminium brackets. The stunning paint work was laid down by Ben Oud from Motorspuitwerk, it’s understated but of the highest quality with black and contrasting rich cream broken up by precision pinstriping work. The conventional wisdom in recent years in getting an older bikes front end up to scratch is to either upgrade the internals of the standard forks or go all out on a full USD fork conversion. However for Henk’s build Motogadgets found the perfect middle ground with a CBR900 setup that brings twenty years of engineering advancement while keeping the look understated being a conventional telescopic fork setup. The CBR also donates its big drilled brake rotor and Tokico caliper for vastly improved stopping power. The rear end sports a beautiful alloy MotoLanna swingarm that gives increased adjustability and lighter weight and is sprung with a set of YSS rear shocks giving Henk an XS that runs likes it’s on rails. If there is one element of the XS650 that makes it a stand out it’s the engine. Old school parallel twin charm, a great sound and torque across the rev range it just makes for a fun ride. To improve things even further Motogadgets swapped out the carbs for a new set of Keihin items to improve fuelling and are fed by dual K&N air filters. 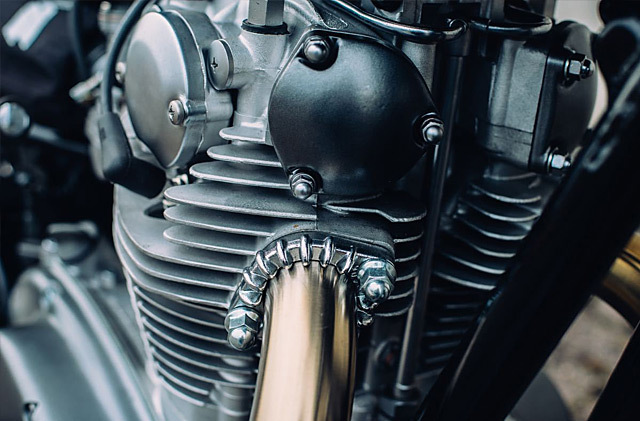 The exhaust took a while to come up with; Henk wanted an ultra-clean look and finally settled on a set of stainless steel pipes that have been bent to perfection. While the mufflers are set of Supertrapps that match the stainless steel and give even more adjustability with their Tuneable Disc Technology. To take 30 years of grease and grim off the outside of the engine, it was pearl blasted and then selected items sprayed in a deep metallic grey. A tracker really needs the right wheel and tyre combination and sometimes you just can’t go wrong following a tried and true method. The rims are the ever popular and high quality spoked items from Excel that are laced to the standard drum rear. While tyre choice is of course nicely treaded for road holding in all conditions and come from Firestone. Keeping the clean theme going Henk picked out a simple Daytona Speedo while Jeffery grabbed some headlight supports from LSL and the end result is simplicity at its finest. 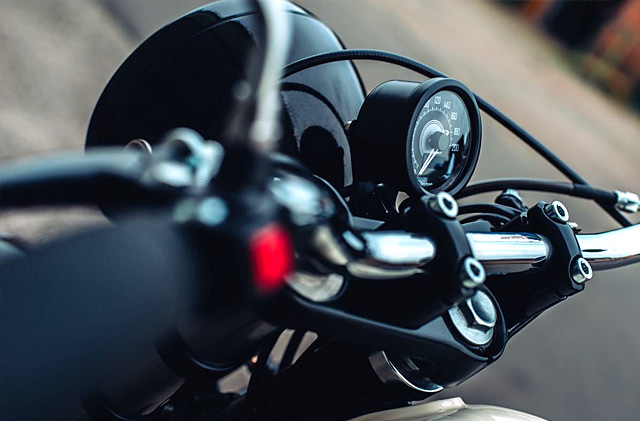 While different bikes are built for different purposes and some only see the track or short blasts through the city streets, this tracker was designed by Henk to be ridden in all conditions and even do long journeys. To prove it the shake down run was a 1300km journey across Western Europe from Amsterdam all the way to the beautiful Biarritz in Southern France. After all these years Henk’s back on the road with a bike he designed himself that not only looks the business but won’t break his back like the old hardtail, even on the longest of journeys. He might be retired but his motorcycle life has been reborn and what better way to do it than on a beautiful Café Tracker that roams the picturesque countryside of Europe in style.